Capture the wild spirit of Cancun’s nightlife with skip-the-line entry to Mandala Beach Club including unlimited drinks. Dress to impress and feel like a VIP as you enjoy skip-the-line entry to the glamorous Mandala Beach Club — renowned for its weekly pool parties. Dance to live DJ sets beside the pool or soak in the Jacuzzi as you sip drinks from the open bar until the early hours of the morning. 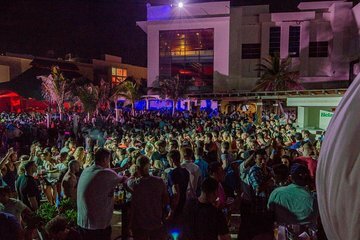 Don’t miss this exciting experience of Cancun’s famous nightlife. The Manadala Beach Pool Party was okay. Nothing extraordinary. They play house music the entire night and had no seating unless you buy a bottle. Ended up leaving and having a better time across the street. Great bar became better after Thomas cook and first choice crowd left!